Oh I’m really excited today because I got something that’s almost impossible to get. 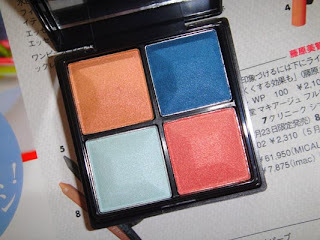 It’s the 2008 Summer Limited Edition Eyeshadow Quad – 10 Summer Escapade. Yeah it’s been more than a year and a half. Even a used one is hard to spot, not to talk about a brand new one! 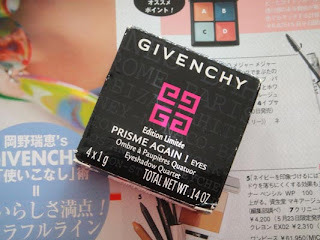 The packaging is really pretty, not like a regular Givenchy eye palette. The size is the same though. 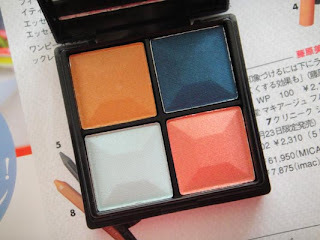 I’d say it’s pretty small for a 4 color eye palette. The box is a little beat-up due to shipping or wear and tear but that’s alright. See the background, that’s the one! I busted out my old Biteki magazine just to take some pictures. The colors from top left is brownish orange, deep navy blue, reddish orange and light pale blue. The combination is really summer-y. It doesn’t seem like having a lot of glitters in it but I could be wrong. 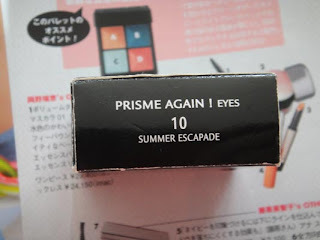 I haven’t swatched them yet. Even under the flash, it only shows a fine shimmer. Summer palette must have No. 4 from 2008. I think I started wanting it after I saw the magazine but at that time Sephora had already sold out. 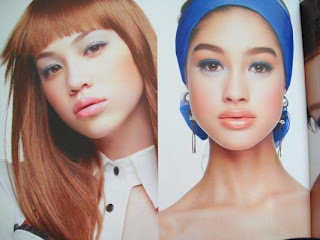 My most favorite look is the right side one. 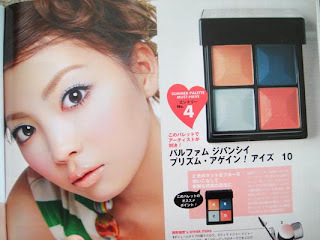 The model’s eyes are more intense and the cheek color is really rosy. 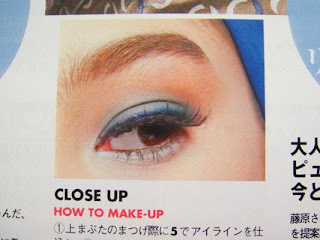 A close up picture of her eye makeup. P.S. I really want to shout out a big thank you to Yuki’s Lazy Channel. I actually got this palette from her blog sale. It took her a lot of effort to make it happen but we finally did it. She’s such a sweet person. Oh, this looks like the perfect summer palette! The colors are so intense and yummy! love the colors in this palette, so bright and vibrant! That's such a amazing palette! I did put blush on, but for some reason when I took the pictures it didn't show up as much as I had hoped it would!